Best web hosting service in Bangladesh. Web Host BD is a name of web hosting company of Bangladesh. We provide quality web hosting and domain name registration service. You can get various hosting package from us. You can get over load free hosting from us. Web Host BD provides quality customer support 24 hours and 7 days a week. We care about 100% customer satisfaction. If you need hosting for your business, you can purchase from us without any hesitation. 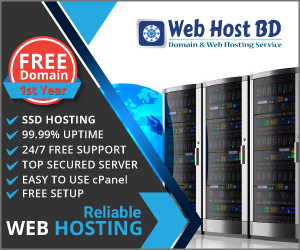 Web Host BD is a the best web hosting service in Bangladesh. Do you want to build up a website for your business or personal use? You can contact with us. Web Host BD provide web design service also. If you need any help about web hosting, domain registration, web design and development so you can contact with us any time. Our contact number: 01912-310191, 01722-618367, our skype: webhostbd.com, our email: webhostbd.com@gmail.com.